Update your old ads now! Standard Text Ads disappear on January 31, 2017. Google announced a lot of new updates at its annual Performance Summit in San Francisco earlier this year. There was a lot of focus on mobile (up to about 60% of all search queries), but the most frightening and exciting change was the Google AdWords update of Expanded Text Ads (ETA). Perhaps Google was already thinking about Expanded Text Ads when they surprised everyone by removing right-side PPC ads in February. Focusing on the PPC ads at the top and bottom of the SERP allowed Google to streamline their ETA update. The new Expanded Text Ads work the same on desktop, mobile, and tablet so your optimized ad text will engage customers on all devices. Whenever Google makes a big change like this, other search engine advertisers are bound to get on board. Bing Ads understands that most of their advertisers also use Google AdWords, which is why they announced their own Expanded Text Ads update in June. Both search engine giants have argued that this change will positively impact advertisers’ click-through-rates, traffic, and revenue, and we agree. Before the Expanded Text Ads update, advertisers had the option of creating a “mobile-optimized ad.” Most people ignored this option, failing the see its importance. Now, with just one format, the copy is automatically optimized for different screen sizes. Expanded Text Ads are exactly what they sound like. You now have more real estate (45 additional characters) for your text ads. While Standard Text Ads allowed a total of 95 characters (25-35-35), the new Expanded Text Ads have adopted the 140-character limit made famous by Twitter. You now have two headlines (up to 30 characters each) up from the old one headline (up to 25 characters). This is around 50% more ad text for you to advertise your products and services. For example, if your URL is www.exampleplumberco.com, you can choose a path that tells the user more about your landing page. For drain cleaning queries, you might select www.exampleplumberco.com/Plumbing/Drain-Cleaning. The path has no navigational purpose; it merely provides additional descriptors for the user. 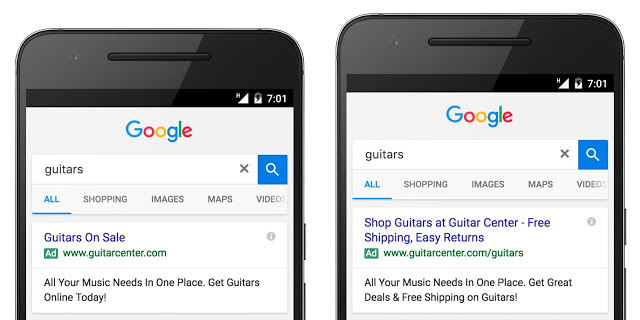 Learn more about Google Standard Text Ads and Expanded Text Ads here. When do Expanded Text Ads go into effect? 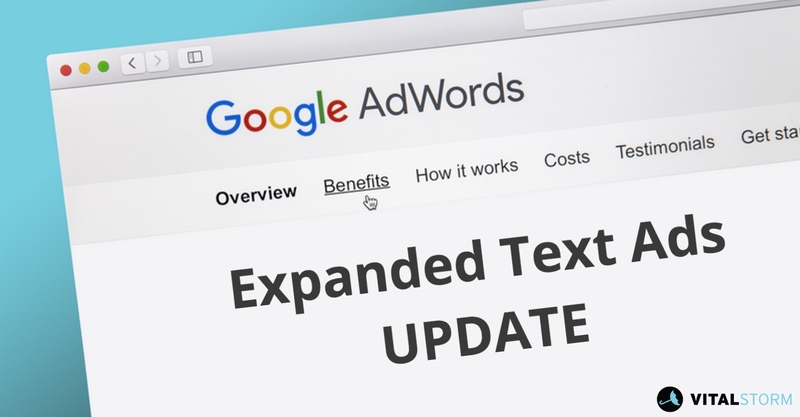 Expanded Text Ads are available now on the Google Search Network, Google Display Network, and all AdWords tools that support text ads. Ad extensions are fully compatible with ETAs. Now, when you create a new ad, AdWords takes you to the default ETA format. You can switch back to the standard text ad format by clicking on the link above the “Final URL” field, but not for long. Standard Text Ads are going away for good. Although your standard ads will continue to run past January 31st, you will no longer be able to edit them. This is why you need to rewrite your ad copy NOW! PPC campaign managers are known for being great with numbers, analytics, and technical details like bidding and keyword matching. Now, things are becoming more automated, which prioritizes creativity and compelling copy. PPC campaign managers have to be effective writers and marketers too! You have until January 31, 2017 to convert all your old ads to the new ETA format. Rethink the entire ad creative rather than just adding a second headline. Take advantage of the extra space to include additional selling propositions. Don’t forget about keyword insertion and ad extensions. Test, track, and optimize ads. Read Google’s Official Guide to Optimizing Ads and Messaging. Speak with your PPC agency about their Expanded Text Ads strategy. Although not all PPC campaigns will follow the same strategy, it’s probably a good idea to keep your Standard Text Ads running while tracking the success of your new Expanded Text Ads. Testing is still necessary, but be aware that eventually the old ads won’t work anymore. Test multiple ETA strategies and go with the one that converts the best. Although we haven’t had much time to test the improvements of the new Expanded Text Ads, we’ve already witnessed an upswing in conversions. Learn more about our Expanded Text Ad strategy by giving us a call or shooting over an email. If you’re not tracking conversions, you’re driving blind. Your PPC ad text is the first thing prospective leads see. Not only that, it is the main clickable space of the ad. More than ever, the headline is the key factor of your PPC success. The extra headline included in Expanded Text Ads allows you to say more. The headline will normally take up one line on desktop and two lines on mobile, but they will both always have a dash between them. Don’t think too much about the line break on mobile since “there’s no guarantee where that line will actually break” (Google). Most people will simply scan the first few words of the headline before deciding to click, read on or scroll down. Your headline should be clear, powerful, and attention grabbing. You only have a few seconds—choose wisely. What are you promising the customer? Ideally, your offer is unique and competitive. Although the offer or benefit will vary across industries, start by imagining what your audience wants. Test your call-to-action placement in the first and second headline to see which works best. Headlines that promise a benefit convert more. Use the language of the user in your ad copy. Manage your keywords and copy based on data from your search terms report. It pays to localize your ad by including the name of the region or city in the headline. Try to avoid generic sales text like “call today” or “sign up now.” If there is not a real sense of urgency, try not to be too “salesy.” Test all of your promises and benefits to find what works. Replicate your successful Standard Text Ads into the new format. But be careful not to obfuscate your message with jargon. Your headline should say what you want it to say, in simple language. Just because you have more space doesn’t necessarily mean you should use it. On average, longer headlines sell better, but test shorter headlines as well. Something as simple as “#1 Dallas Electrician – Need An Electrician Today, Sunday?‎” might be all you need. Repeat your winners. 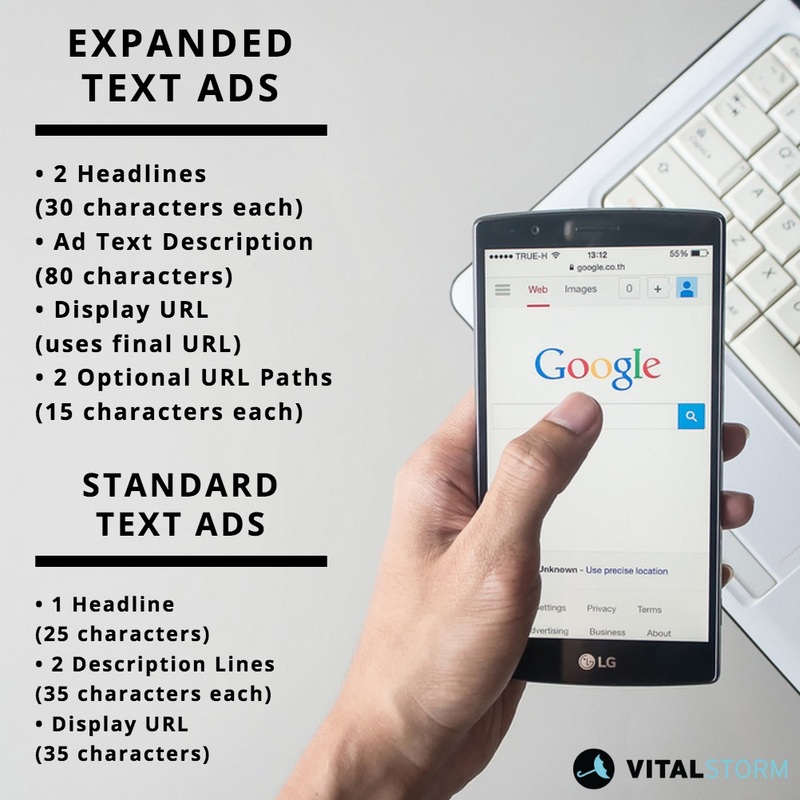 For more Google AdWords advice, follow VitalStorm and AdWords on Twitter and look through the tweets tagged with #AdWordsTips. If you have any questions about other recent Google or Bing updates, just give us a call or shoot us a message. Get Qualified Leads Today! Give us a call at 1-877-311-5695. We follow and report on all the latest PPC and SEO news. Keep in touch with us on Facebook, Twitter, and Google+ for the latest digital marketing news and information.